Prevent ponding water in Pembroke Park with Precast Concrete Scuppers designed and installed by the skilled team at Atlantic Coast Precast. Since 1965, our team has poured precast products for a variety of purposes, working closely with industry professionals to customize their blocks. Our cost-effective solutions for controlling ponding water on roofs and decks are easy to personalize when you choose precast. Call for a FREE quote to get started. Rotting wood on a roof and deck can be a major issue, whether the property is residential, commercial, or industrial. Mold and mildew can invade the structure of your building for severe damages in Pembroke Park. 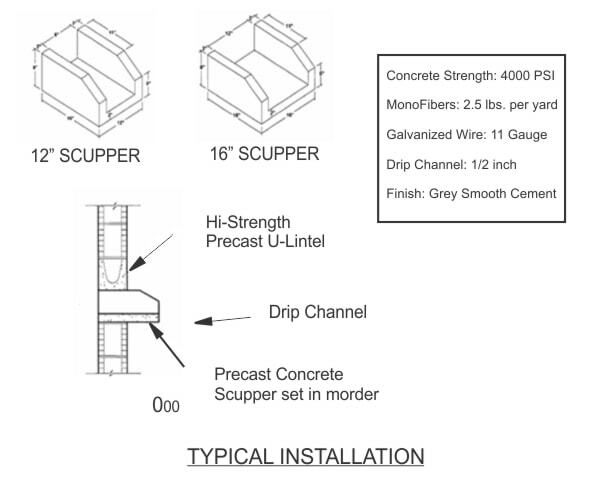 Precast concrete scuppers will allow rainwater to exit through outlets in your parapet walls or gravel stops. Leaves and debris will be easily pushed through, without becoming trapped or blocked, unlike other drainage solutions. For professional, flawless installations, trust Atlantic Coast precast in Pembroke Park for precast concrete scuppers. Our team works closely with industry professionals to cast customized scuppers to unique specifications, samples, and sketches. Our scuppers come in a variety of sizes from 8 inches to 18 feet, for larger industrial facilities with a high velocity of water. Call today to learn more about our downspout splash guards which can help channel water away.